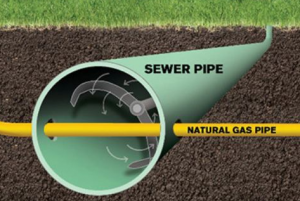 A cross bore is usually found in urban and suburban areas when a new utility line is unintentionally bored through a sewer pipe. Why is a cross bore dangerous? When a professional drain cleaner or homeowner attempts to open a clogged line with a cutting tool, it could expose them to the hazardous risk of an electric shock or natural gas leak that could result in a fire or explosion. If you have a clogged line, call 811 before you clear, especially if you know there are buried electric or gas lines within your community. Dialing 811 will connect you to Pennsylvania’s One Call System and you should use the phrase “sewer clearing” or “drain cleaning” and the rep will contact the utility to respond immediately. If you detect the odor of gas at any time, stop all work and evacuate the area.